, an eminent antiquary, was born at Bern in Switzerland, it does not appear in what year. 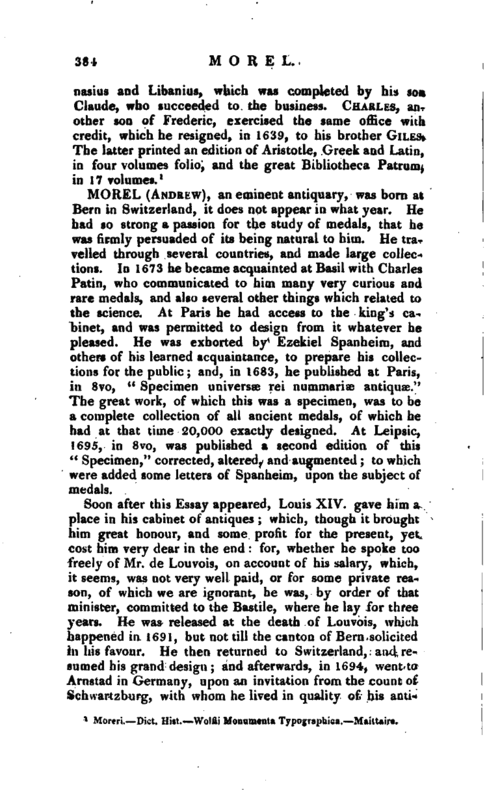 He had so strong a passion for the study of medals, that he was firmly persuaded of its being natural to him. He travelled through several countries, and made large collections. In 1673 he became acquainted at Basil with Charles Patin, who communicated to him many very curious and rare medals, and also several other things which related to the science. At Paris he had access to the king’s cabinet, and was permitted to design from it whatever he pleased. 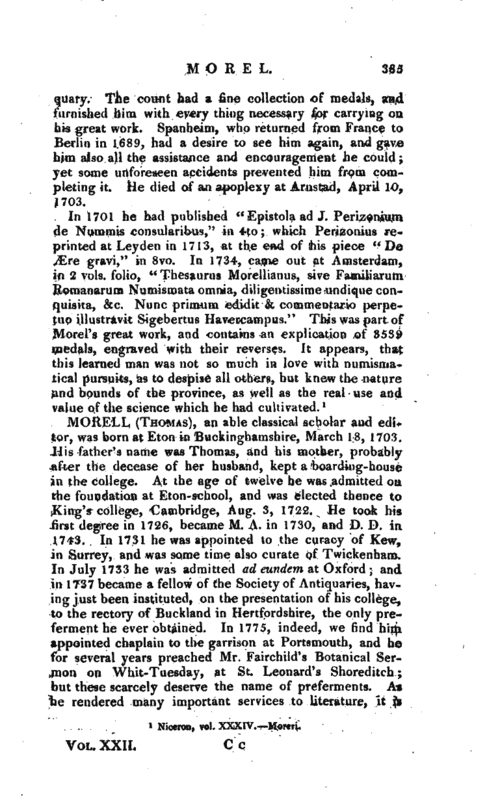 He was exhorted by Ezekiel Spanheim, and others of his learned acquaintance, to prepare his collections for the public; and, in 1683, he published at Paris, in 8vo, “Specimen universae rei nummariae antiquae.” The great work, of which this was a specimen, was to be a complete collection of all ancient medals, of which he had at that time 20,000 exactly designed. At Leipsic, 1695, in 8vo, was published a second edition of this “Specimen,” corrected, altered, and augmented; to which were added some letters of Spanheim, upon the subject of medals. Soon after this Essay appeared, Louis XIV. gave him a place in his cabinet of antiques; which, though it brought him great honour, and some profit for the present, yet cost him very dear in the end: for, whether he spoke too freely of Mr. de Louvois, on account of his salary, which, it seems, was not very well paid, or for some private reason, of which we are ignorant, he was, by order of that minister, committed to the Bastile, where he lay for three years. He was released at the death of Louvois, which happened in 1691, but not till the canton of Bern solicited in his favour. He then returned to Switzerland, and resumed his grand design; and afterwards, in 1694, went to Arnstad in Germany, upon an invitation from the count of Schwartzburg, with whom he lived in quality of his | antiquary. The count had a fine collection of medals, and furnished him with every thing necessary for carrying on his great work. Spanheim, who returned from France to Berlin in 1689, had a desire to see him again, and gave him also all the assistance and encouragement he could; yet some unforeseen accidents prevented him from completing it. He died of an apoplexy at Arnstad, April 10, 1703.